Yiwu Shining Crystal Import & Export Co.,ltd is a professional and comprehensive company of crystal glass arts & crafts, founded in Yiwu, Originated in Pujiang, which is famous as crystal city. We have been in this field for more than 10 years. With experienced designers, technologists and advanced machines of our partner factories, we specialize in the manufacture of high grade crystal gifts and crafts. Therefore, our innovation and technology qualify us as an excellent factory and trading company which can handling various kinds of crystal glass crafts. 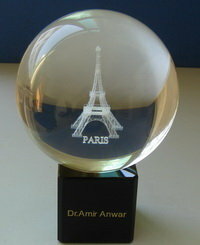 Our business is mainly covering blank crystal glass,crystal glass trophy award, 3D engraving crystal glass, crystal glass key chains, crystal glass diamond,crystal glass candle holder, crystal glass wedding gift, crystal glass office stationery, crystal glass paperweight, crystal glass ball, crystal glass clock, crystal glass pyramid, crystal glass lotus flower, crystal glass ashtrays, crystal glass vases, crystal perfume bottles, crystal models,crystal glass religious gift, crystal glass apple, crystal glass photo frame,crystal animal figurine,crystal glass crafts. Whether for corporate gifts or for personal souvenirs, we have a wide selection to choose from. Especially, we have specialized designers who can make perfect designs for you. We can custom etch & engrave your words, logos and images to your exact specifications. With impeccable quality and competitive price, Shining crystal have been presented to Presidents, heads of state, CEO of major corporations, top sports legends and entertainment celebrities,etc. And have been exported to North America, Europe, Southeast Asia and Japan, South Korea, Africa,South America,etc. We are building the Number One of crystal crafts manufacturer and trading company!!! Welcome to all enquiry for further information.